I am in the middle of moving out of my parents house so I don’t have much time for cooking. The last few weeks have been insanely busy but hopefully now that I’m out of the cooking competition I will finally be able to get on with things that have been piling up for weeks! So far I’m half moved into my new place. The previous tenant hadn’t cleaned at all and left the place in a right state. Luckily we came prepared with my mum’s Dyson and stream cleaner but even so the kitchen alone took 4 hours to clean! But I am now starting to get there. 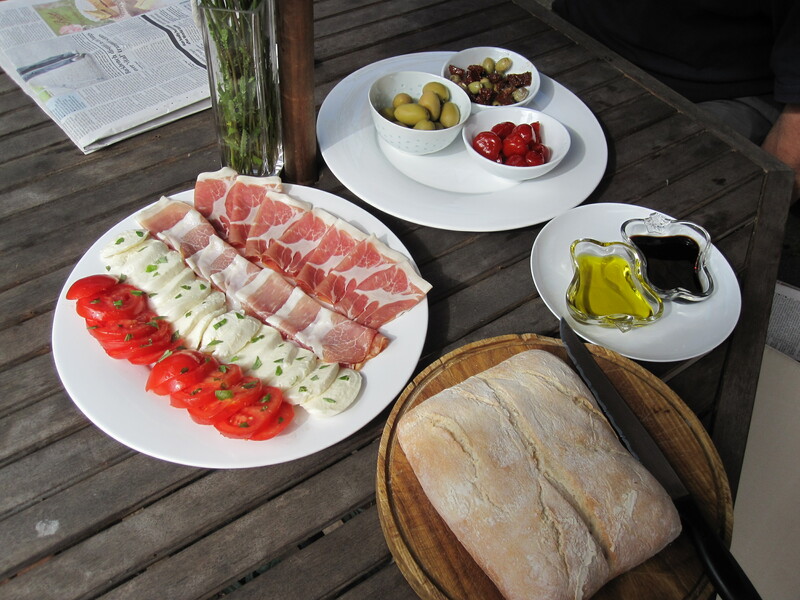 If you are insanely busy but still want to do something just a little bit special, may be just having a neighbour round for drinks to enjoy this lovely summer weather, why not prepare a plate of Antipasti? It’s quick, no cook, simple, delicious, oh so lovely to look at and even better to eat! A loaf of crusty bread or ciabata. Sliced tomatoes and mozerella drizzled with olive oil and shredded basil. Olives, sun dried tomatoes and picante peppers. Olive oil and balsamic vinegar for dipping. Just unwrap everything, put it on pretty plates or bowls and sit back in the sunshine and enjoy!